OUR EASTER GARDEN GROWS BETTER WITH CHOCOLATE! Send a spectacular `Easter Garden` featuring bright and bold seasonal flowers artfully displayed in a rustic, re-usable wooden crate. Our florist team select the freshest, in-season blooms from the market on-the-day, and create a luscious flower arrangement in tones of lime, sunshine yellow, rich purple, vibrant orange and hot pink. Why not add chocolate? It is Easter after all! Include a small treat with your flowers - check out our range of choccies featured under `Sweet Treats`, the creme filled chocolate bunny boxes are divine! Send these flowers online for Easter or phone 1800 66 66 46. 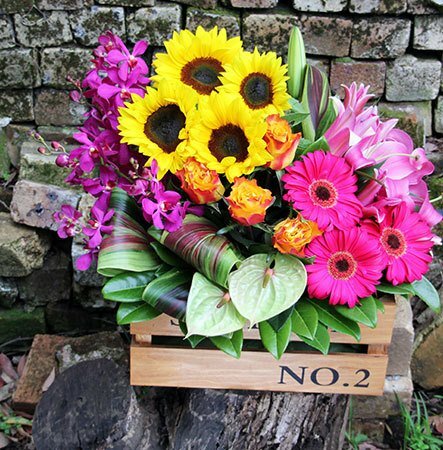 *Please note: The pictured flower arrangement and wooden crate is exclusive to Sydney flower deliveries only. For flowers delivered elsewhere in Australia, the team will coordinate your order via an affiliate florist to recreate our style as closely as possible.